ONE hundred years ago, troop ship movements were taking place all over the country as contingents of the 1st Australian Imperial Force made their way to Albany, WA, to sail for Europe and towards the battlefields of the First World War. A convoy of New Zealand ships was also sailing across the Tasman Sea and around the southern coastline, under the protection of British, Australian and Japanese naval vessels for the two-week voyage. The Australian and New Zealand ships would then sail together from the West Australian coast, once all of them had been assembled in King George's Sound, off Albany. The plan had been to sail several weeks earlier, but there had been several postponements due to concerns over the whereabouts of a number of vessels in the German squadron known to be in the Pacific at the time, in particular the cruisers Gneisenau, Scharnhorst and Emden all correct. The newly elected Prime Minister, Andrew Fisher, was growing increasingly nervous about the safety of Australian ships as they sailed around the nation's coastline, and he was unhappy about them being unescorted. 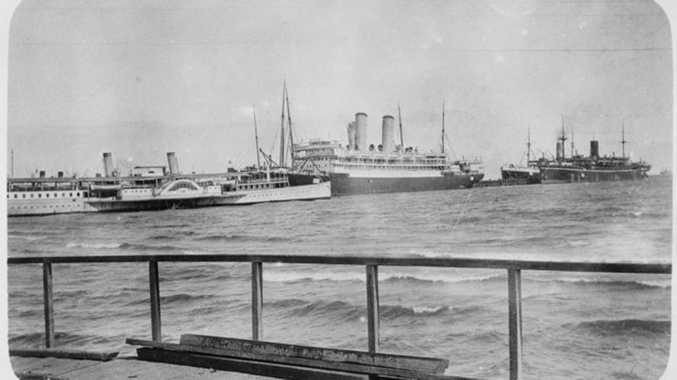 In deference to the anxieties of both the Australian and New Zealand governments, the British Admiralty delayed some of the departures and worked to arrange adequate transport to "pick up" ships and convoys sailing from various capital cities and Auckland. One of the few exceptions was the Omrah, which had sailed unescorted from Brisbane on September 24, 1914, with the 9th Battalion and medical staff, the same day the Australian Government had cabled the Admiralty inquiring about the safety of independent troop ship movements down the coast. The Admiralty had replied it believed transports around the Australian coast were "free from undue risk", but nonetheless boosted the provision of its support vessels, and ensured the Omrah was at least escorted into harbour at Melbourne, where it would wait until it was deemed safe for the rest of the contingent to continue their journey towards Albany. The Queenslanders waited almost a month. General William Bridges, commander of the AIF, was unhappy with the delays because it meant deferring when his men would be ready for service. He had wanted to sail within about a month of recruiting starting in mid-August, but he was forced to defer to the Admiralty and government nerves. General Bridges was not the only one unhappy about the time being lost. In his Official History of Australia in the War of 1914-1918, official war history Charles Bean wrote: "The postponement was exceedingly trying to the men. They had said goodbye to their friends; they had been strung up to the excitment of departure; and this had now to be relaxed and the routine of elementary training picked up again where they had dropped it. "In the course of the next four weeks, two or three further false alarms as to the date of starting brought them to a frame of mind in which they began to doubt if they would ever start at all." Bean said the delays were also starting to cause disciplinary issues among the ranks, and it was not uncommon for some brigadiers to send out army vehicles in the early hours of the morning to pick up stray soldiers who had been enjoying the delights of the capital cities before setting sail for war. Eventually, word came through from the Admiralty on September 30 that two of the German cruisers had bombarded French Tahiti, meaning they were not considered a danger to the Australian convoy. The Emden was still believed to be at large, but did not factor in the plans at this point - although the Australians would encounter the ship in several weeks. Ships began arriving off Albany from eastern Australian ports from October 24, and the New Zealanders arrived four days later. The route the convoy was to take to Europe changed a number of times, and at one point it was to go via the Cape of Good Hope. But it was decided at the last minute to return to the original plan of heading for Egypt via the Suez Canal - a decision that would determine the subsequent history of the Anzac forces in Gallipoli because of their proximity to that battleground. They would be ready to sail by November 1. There would be no turning back. IT WASN'T just naval vessels transporting Australian troops to the battlefields of the first World War. According to Charles Bean's Official History of Australia in the War of 1914-1918: "The transports for the first contingent had been chartered by the Australian Government from among the largest ships then in Australian ports - passenger liners and great wool, meat and butter carriers. "They had been hurriedly fitted with mess tables and hammocks, until their lower decks looked like huge crowded barrack rooms. "A heavy price was paid for every day's hire of each ship, and any delay in sailing was not only most trying for the troops ... but also highly expensive to the country." 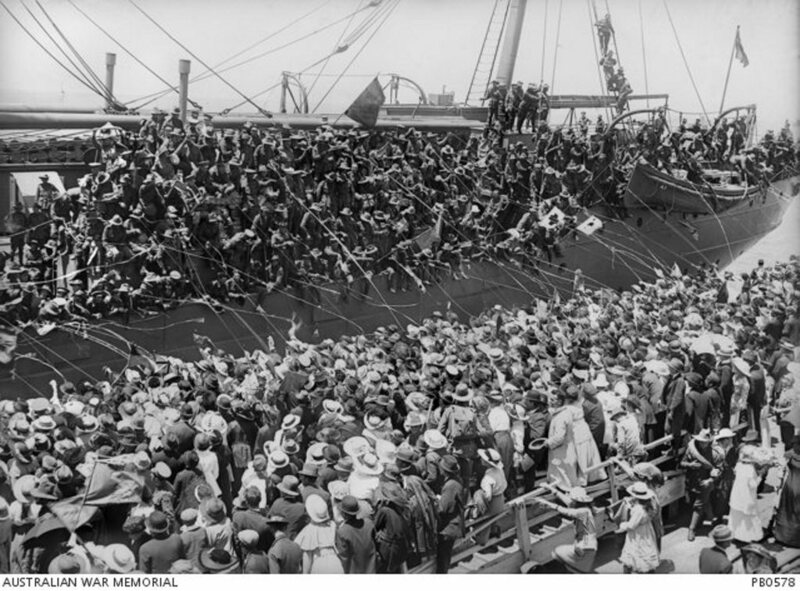 THE first contingents to set sail from Australian ports during the First World War marched past cheering crowds, and were seen off with speeches and brass bands. This was a repeating scene at thousands of farewells at hundreds of places - on wharves and on railway platforms, in streets of towns and cities. Bands played as people sang Auld Lang Syne and God Save the King. Gifts were presented, such as pipes, watches, fountain pens or wallets - and often those gifts came home in the "effects" of men killed at war. While the 20,000 men of the 1st Australian Imperial Force contingent to sail from Western Australia in November 1914 were not allowed ashore once their troop ships had assembled in King George's Sound, the people of Albany observed the departure of a 7.5-mile-long convoy of vessels from the Australian and New Zealand forces. Many hundreds of the soldiers threw messages in small bottles over the side of the vessels, begging the finders to convey words of farewell to loved ones. As the war wore on, however, the farewells became less elaborate, sobered by the casualty lists coming home from Gallipoli and the Western Front. For many wives and families, the last memory they had of their loved ones had been at the dockside gates before their departure for battle. Long after the war, wreaths were laid by mothers wearing black on Anzac Day outside dock gates. In Sydney's Woolloomooloo in 1922, a small but haunting memorial was unveiled, inscribed to commemorate "the place of farewell to the soldiers who passed through the gates opposite for the Great War".